Boko Haram shooting, fire-bombing and slashing terrify fleeing residents. 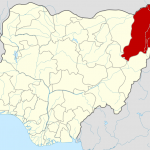 JOS, Nigeria (Morning Star News) – After weeks of sacking villages and destroying church buildings around Nigeria’s northeastern town of Gwoza, Islamic extremist group Boko Haram on Wednesday (Aug. 6) killed an estimated 100 people in the predominantly Christian town, sources said. The shooting, fire-bombing and slashing of men, women and children in Gwoza, Borno state, as initially the military reportedly fled before an insurgent force backed by international terrorist groups, began at about 4 a.m., producing eyewitness assertions that Boko Haram, which seeks to impose sharia (Islamic law) throughout Nigeria, had taken control of the town of more than 276,000 people. Local residents reportedly said at least 100 people had been killed. The full magnitude of the attack and the Nigerian military response was unknown as most sources have been forced to flee to Cameroon or Adamawa state, but on the initial day of the assault Pirda Tada, a Christian resident of Saha village, told Morning Star News that Boko Haram gunmen arrived in Toyota Hilux vehicles and motorcycles and attacked houses with Improvised Explosive Devices (IEDs) and fuel-bombs. Six Christians were killed at Saha village, and the insurgents destroyed houses and shops and burned the Church of Christ in Nations (COCIN) building in Pegi Barawa village, Tada said. Boko Haram rebels on July 19 had attacked Saha and Pegi Barawa village, near Gwoza; six Christians were reported to have been killed in Saha village. Francis Mbala of Gwoza confirmed that Boko Haram attacked Saha and Pegi Barawa this week. “The COCIN church and some houses and shops were burned down,” he told Morning Star News. 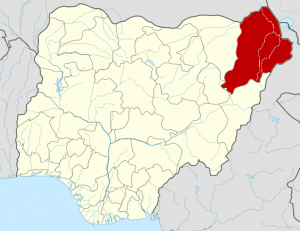 Since December, Boko Haram has also attacked in the Gwoza area the villages of Mainok, Barawa, Chinne, Arbakko, Attagara, Ngoshe, Klala, Kunde, Hembe, Gathahure, Klala, Himbe, Amuda, Agapalawa, Ashigashiya, and Chikedeh, Mbala said. John Gula, a leader in the Christian community in Gwoza, told Morning Star News by phone that 42 Christians were killed at Attagara village; 24 in Agajara; four in Angurva; 20 in Agapalwa; one in Amuda; three in Alavawa; 13 in Chinene; three in Arboko; one in Ashigashiya; and one in Ngoshe. It is estimated that more than 300,000 Christians have been displaced from the greater area, forcing many to flee to neighboring Cameroon. In December Christian leaders had reported plans by Boko Haram to attack Christian communities in Gwoza. COCIN leaders and the denomination’s Gwoza District Church Council (DCC), in collaboration with the leadership of the Christian Association of Nigeria (CAN) in Gwoza, sent a petition to the Borno state government and security agencies reporting a threatening letter that Boko Haram had sent to Christian communities in Gwoza. In December 2013, 15 Christians were killed, 274 houses were burned and 12 church buildings were destroyed by Boko Haram gunmen, the Christian leaders wrote in their letter. Yakubu Toeye, a Christian from Gwoza, told Morning Star News that the 12 church buildings destroyed in December were located in the Gwoza hills settlements of Kunde, Hembe, Gathahure, Himbe and Klala. The Rev. Joel Y. Ndirmbita, secretary of the COCIN DCC, signed the petition calling attention to the plight of Christians in Gwoza area. You are right to say the U.S. is or will be included in these terrorist acts by the ISIS. If Americans think their safe from these animals then they need to open their bibles…Because there will come a day when even us Americans will have to Declare Christ as or God or get our Throats Slit….Its that simple people….Even as I type this there is Terrorist Cells right here in our home land waiting for the right time to do Isis bidding…Which city will be first? God bless us all, our future is not looking promising. Those people don’t represent Islam at all. Islam condemns these actions, and I hope our Christian brothers understand that. These are barbaric animals. I shouldnt even call them that; they are lower than animals. My condolences to the victims, and my thoughts and prayers are with their families. I am SICK of hearing that these vermin do not represent Islam. Yes, they do. They are FANATICAL about Quranic doctrine and follow Quranic doctrine to the letter. If these vermin did not represent Islam then where are the global displays of outrage that the Muslims are so skilled at organising over trivia like cartoons? There are NONE. There is a reason for it, because ALL Muslims know very well that these vermin are exactly what they say they are, ‘soldiers of Allah’. They emulate their ‘prophet’ – a professional slaver who told his men that they were entitled to kill ‘infidels’ and help themselves to the surviving women and children and land and property.